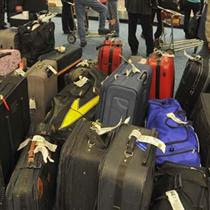 Two airlines, US Airways and Alaska, say they're going to pile on some new charges for checked baggage. "USA Today" reports US Airways customers will have to pony up five-dollars for every piece of luggage checked at the airport beginning with flights on July 9th. That extra fin can be avoided if passengers check in with the carrier online within 24 hours of their scheduled departure. US Air already charges $15 for a first checked bag and $25 for a second. The new fee would be on top of that. Meanwhile Alaska Air will begin charging $15 for a first checked bag beginning with tickets purchased May first for flights on or after July 7th. US Airways announced yesterday it lost $103 million during the first three months of this year. Alaska Air was hurting too with a $19 million loss. The additional levy for baggage can generate millions of dollars in extra revenue. Delta Airlines hopes to boost its bottom line by about $100 million each year by charging a $50 fee for a second checked bag on international flights. That fare bump will begin on July 1st.